Messaging now seems to be more popular than actually calling somebody, and this is great for being able to reminisce old conversations, or to keep a record of what was said for legal reasons. When you connect your iPhone to iTunes, iTunes will create a backup of your device, and this backup contains all of your messages stored on the device at this time. This is handy, because if anything then happens to the iPhone (messages deletion, water damage, screen breakage, stolen device), at least your data will be backed up. The only problem is, you can't use iTunes to access the contents of the iTunes backup in order to see or save individual messages. However, you can use an iPhone SMS extractor like iBackup Extractor to access your backup, extract any SMS, MMS, iMessage and WhatsApp conversations from your iPhone backup, then save them to your computer. Download and Install iBackup Extractor from the button below. Start iBackup Extractor from your desktop (PC) or from launchpad (Mac). Select the messages you would like to save, and click "Copy Messages"
To view SMS, MMS and iMessage content on your backup, click the Messages icon in the category list in iBackup Extractor. iBackup Extractor displays a list of contacts with whom you have had conversations with. Clicking on the contact in the list shows the text (SMS), multimedia (MMS) messages, iMessages and WhatsApp messages sent and received in that conversation. With a contact selected and a conversation displayed, click "Copy Messages" in the iBackup Extractor control bar to save that conversation to your computer. iBackup Extractor will copy the conversations into a .html file, which is saved into a folder selected by you (default is your computer desktop). Each .html file containing the conversations is named after the individual contact with whom you had the conversations. You can open this .html file using a browser such as Firefox or Internet Explorer. 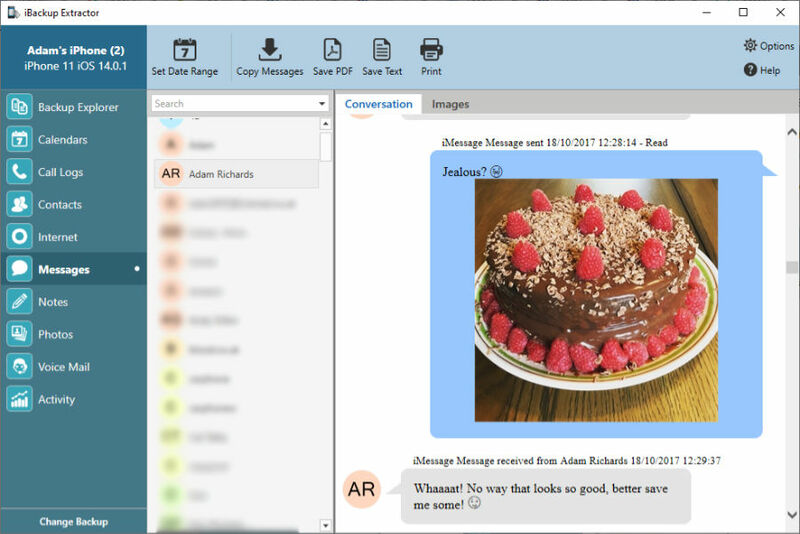 If your conversations also contain images or pictures (MMS), iBackup Extractor will also copy these to your computer and embed them in the .html file saved. You can also copy your message conversations as a PDF file by clicking the "Save PDF" button, or as a text file by clicking the "Save Text" button. If you wish to print messages out from a backup made of your iPhone, simply select the messages you would like to print and click "Print" from the iBackup Extractor toolbar. You'll be presented with your PC or Mac's default print settings. When you're happy with the settings, hit Print. 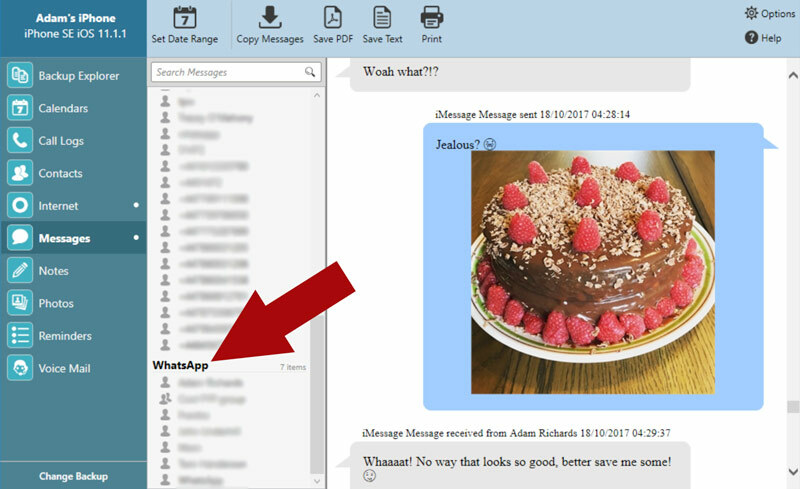 iBackup Extractor can also access and extract messages sent and received using WhatsApp. If your backup contains such messages, they will be displayed under the WhatsApp header in the Messages tab in iBackup Extractor. As with other types of messages, simply click on a contact to open the conversation, then click "Copy Messages" to copy the thread to your computer.